It’s here and coming to a school near you. 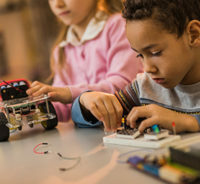 Coding, Robotics and Makerspaces (CRAM) comprise the latest trend in educational reform. Is CRAM the marketing hype of an information technology industry? Is it the next new thing for grantmakers, the hope—and perhaps fear—of K-12 educators, or the reasonable expert estimate of a sea change in education? Perspectives on the potential impact and importance of CRAM differ dramatically, often falling into two camps. In a recent Horizon Report on education technology trends, the education information technology directors’ Consortium for School Networking and higher education’s New Media Consortium are particularly positive. They identify CRAM as likely to accelerate technology adoption in K-12 education. CRAM might hold great potential for active learning. Yet most school district’s CRAM initiatives provide the illusion of a cutting edge education, while the system as whole—and, indeed, the implementation of CRAM—remains buried in the past. Numerous districts point to success in a few classrooms or schools. However, most view CRAM as a supplement, a program disproportionately serving high performing students, and often taking the form of an elective course or an extra-curricular activity. Moreover, the school CRAM programs often rely on a handful of highly motivated, self-taught teachers. The promise of CRAM far outstrips its impact to date. CRAM hasn’t failed so much as it doesn’t seem to have grown beyond a few exceptional classrooms or schools. The history of school improvement is replete with promising innovations that stalled. Unless lessons learned from decades of experience in managing innovative practices at scale are taken into account, CRAM threatens to be the next case in point. Cornerstone 1: Enable key groups to own the initiative. Stakeholders create the initiative. Paradigm-shattering reforms can’t be crammed down the throats of those who must support and sustain them. The CRAM plan should be the outcome of a serious dialogue with parents, teachers, business leaders and philanthropy. Cornerstone 2: Commit to reaching each student in every grade. Every student takes CRAM. This is a fundamental issue of equity. Schools that adopt CRAM as elective offerings simply advantage their best, often wealthiest and primarily male students. But it’s not a level playing field for the future unless all students develop this knowledge base. Employers do not view 21st Century skills as supplemental or elective. All students need to be immersed in the new technologies. It’s the better part of wisdom to introduce CRAM early to develop a strong knowledge base for successful student transitions to college and careers. Cornerstone 3: Put the education in education technology. The entire school day integrates CRAM. There are fewer than seven hours in a school day. We cannot create a separate CRAM course requirement. Math, science, and literacy are integral to any project where students develop robot parts, put one together, and program its functions to perform tasks addressing some design. The curriculum should parallel the technology-intensive world we live in. CRAM activities serve the curriculum and standards. These activities should be engaging and even entertaining, but should not be relief from the students’ “real work.” CRAM should build on and expand students’ knowledge of and ability to meet specific standards at specifics points in the learning process. Cornerstone 4: Make it possible for teachers to succeed. CRAM is core to every teacher’s professional development. If teachers are to integrate CRAM into their portion of the curriculum, they must be supported in building an understanding of how these new technologies fit. If teachers’ are to move past students’ copying their moves at the front of the classroom, they must have opportunities to learn about and create activities that incorporate these technologies into authentic learning. If they are to monitor, assess and capture the results of student learning based on digital media, teachers must have technological means of doing so. Want teachers to succeed? Help them to use CRAM naturally and easily in their classrooms. Cornerstone 5: Prepare for an imperfect rollout. CRAM rollout must be strategic. According to one general, “No plan survives first contact with the enemy.” Perhaps the only sure thing about implementation is the onslaught of problems. District leaders need to structure their rollout strategy so that they can make informed, mid-course corrections. They need to expect problems, set aside resources to address them, listen to frontline educators and students to understand what is going right and wrong and why, and feed this knowledge into improving the implementation of CRAM. Many people understand the promise of CRAM. Yet even innovative educators and caring parents feel a measure of cynicism because they have seen so many school reforms fail to take root and spread. Whether CRAM becomes a dead on forecast of real change or a dead in the water illusory reform depends on whether school districts and states take these cornerstones to heart.